February | 2013 | Better Offer? Let me just reassure my devoted blog followers (and fellow pedants) that I have not made a spelling mistake in the title of this week’s post. For those of you without teenage girls in the family, a Belieber is a fan of that Canadian pop sensation Justin Bieber. Justin Bieber, who is still a teenager himself, is visiting our country as part of his global tour. And I know this – how? Well, quite simply because Small Persons 1 and 2 of 2 are going to his concert next week at the O2 in London. I even know that, as I write this, he is preparing for his 19th birthday on Friday. Amazing the trivia one can pick up from overly excited teenagers! He is not due to perform in London until March 4th, so is doing a little retail therapy in an exclusive part of the city – Mayfair. For those of you who still don’t know who I am talking about, here is a photo of him. Actually, the reason I am showing you that photo is because he went shopping in disguise. Now, I don’t know whether the disguise was to allow him to shop ‘fan’ free or whether it was to fool all the paparazzi who may just have been following him. Either way, it was a very clever disguise which will have fooled all who may have seen it. Although, I can show you a photo of him in disguise. I bet you are wondering how I knew that was him – well, despite his disguise, he was surrounded by his entourage which rather gave it away! 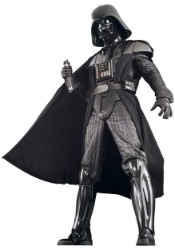 I’m being a little unfair here, that picture was, of course, Darth Vader from Star Wars – here is the real disguise. 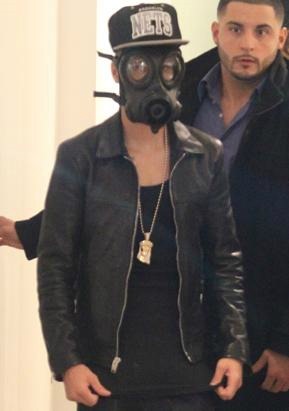 I never mentioned the store the Biebster was visiting, but when I do, I wonder whether you will also see the connection with the need for a mask. The store was ACNE! Well, he is still a teenager. Having now had a little fun at the expense of the Biebster, I will probably be hunted down by Beliebers. I wonder whether I could get away with disguising myself like him. Categories: Film, Justin Bieber, Light Hearted, Music, Postaweek2013, Shopping, Star Wars | Tags: ACNE, Beliebers, Canada, Darth Vader, Justin Bieber, Light Hearted, Mayfair, Postaweek2013, Star Wars | Permalink.